Join the discussion on our forums! 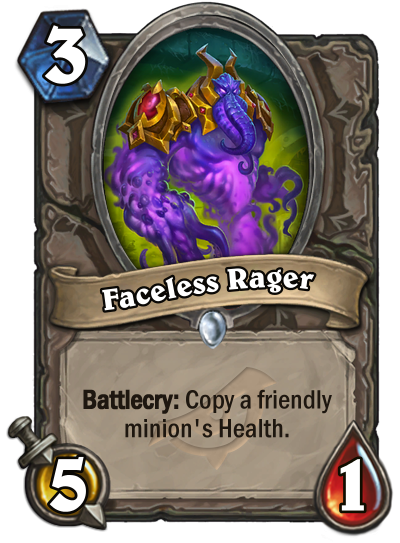 Come discuss Faceless Rager over in our dedicated Faceless Rager discussion topic. Battlecry: Copy a friendly minion's Health. When you need to rage anonymously. I keep looking back at this card for the neutral set. This card will probably be the meta defining neutral of the set. Well played Rager... well played. We're beating away at a dead horse at this point, but hey, you don't see me complaining. Meta defining. It is ok even at 5/2 and it is always going to be good in mid to late game in tempo decks. When you thought they could not think of more crazy looking "ragers"
Upgradeable Framebot was OP and now becomes OP-OP-OP! Can play sooner but synergy depends on damage done between turns. Play quicker against aggressive decks, play slower against control. i think handlock is coming back boys. This isn't the Rager we deserved, but sure as hell it's the one we needed, may it lead us to glory eternal. Wow. This is... good. In some kind of hand deck with Twilight Drake, or even curving out with some of the beefier 2-drops. I can definitely see this being big (and giving even more reason for Silence to be important in the coming meta). exactly what I was thinking! 3 mana 5/6??? Hey look... an actually playable rager. Hey, the rush one was playable, somewhat... in arena.